When it comes to sliding doors in Sydney, there are a couple of main varieties that you’ll want to take into account. In this article, we’re going to have a look at the different types of sliding doors you can buy, but most importantly, what to look for when you are buying a sliding door. We’ll also cover how to get your sliding door repairs done here in Sydney. Of course, that is a service that we provide. But let’s have a look at the different types of sliding doors you can buy. Most sliding doors are a beautiful glass sliding door with an aluminium frame. These types of doors are nice and lightweight. They provide an easy to open mechanism, and they lock nice and securely. So, your aluminium glass sliding doors are by far the best. They have an aluminium frame, which keeps it nice and lightweight, and they’ve got a glass interior. You want to make sure you’ve got a nice sturdy lock as well. Now what we want to do is have a look at the types of components that are in your sliding doors when you’re looking to buy them. Unfortunately, most of the sliding doors that you will be able to purchase nowadays come with cheap parts, so it is important that you have a look and consider the types of internal parts that go into your sliding doors. If you buy the cheaper quality parts within your sliding doors from a cheap manufacturer, then you’ll find that you have to replace them and they become broken, damaged, and need repair quite quickly. By far the most common element, and the most significant element, to your sliding doors in Sydney, is the rollers. The rollers that you get are very important. Hopefully, you’ll get heavy duty stainless steel double bogie style rollers. This means it’s got two rollers to hold the weight of the door, as opposed to just a single roller. When you are looking to buy a door, make sure you have a look at the types of rollers that are on the bottom of that door, or the top if it’s a top-hanging door. The different types of outdoor doors are very important. Most people still have that glass sliding door, and you want to be mindful of any wooden doors that you might have that would be exposed to the elements. Not such a great idea, so most outdoor sliding doors are glass with an aluminium frame. A lot of people do look for the cheapest sliding doors in Sydney, and that is not necessarily the way to go. As mentioned above, what you want to focus on are the rollers, and how heavy the door is. If you are purchasing a heavy door then you must have robust rollers. Otherwise, they’ll break down very quickly. You want to make sure the rollers have good bearings in them to continue rolling smoothly and not get stuck or caught. What about sliding door repairs? Now, when it comes to sliding door repairs, we are a specialist in this service. 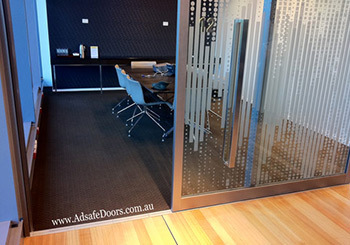 The Adsafe Doors team have been repairing sliding doors in Sydney for over 25 years, and have got all manner of parts and materials to fix and repair your sliding doors. We repair sliding doors every single day, and our team go all across the greater Sydney area. But by far, the most common thing we see is very dirty tracks. People that don’t maintain and look after and manage their tracks, and as a result, the tracks get dirty, damaged, or broken, and that contributes to the rollers getting broken, damaged, or chipped, or cracked. The very first thing we always do is we look at the tracks and rollers when we look at any sliding door repairs that need to be done. The easiest way would be to give us a quick call, and we can give you a quote over the phone if you do have any sliding door repairs.